(PRLEAP.COM) June 23, 2015 - NEO, the simple, powerful LMS for schools and universities will exhibit at ISTE 2015 in Philadelphia between June 28 - July 1. 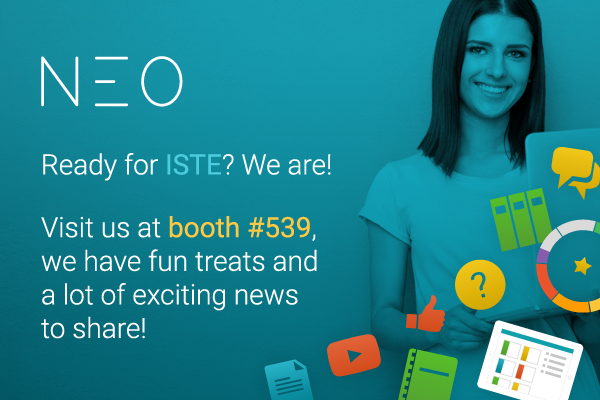 The ISTE Conference & Expo attracts upwards of 18,000 attendees and industry representatives, including teachers, technology coordinators, administrators, library media specialists, teacher educators and policy makers. Attendees enjoy world-class keynotes, hundreds of sessions in a variety of formats and a massive expo hall. NEO will be showcasing its latest features such as gamification, drip content, and their unique rules engine. Attendants can visit NEO in the expo hall at booth #539 to see a live demo of the platform and chat with the team. NEO has prepared a lot of exciting news, unveiling of upcoming features, and fun treats. Attendants will also have the opportunity to talk with the company CEO Graham Glass. Graham will be available for interviews for the extent of the event. To schedule an interview or other press related inquiries, please contact Alina Toderascu, PR & Marketing Coordinator at alina@neolms.com. NEO is a simple, powerful LMS for schools and universities that makes it easy to deliver online education. NEO is a product from CYPHER LEARNING, which also provides MATRIX LMS for businesses. The company was founded in 2007 by Graham Glass, a serial entrepreneur with a track record of innovation.